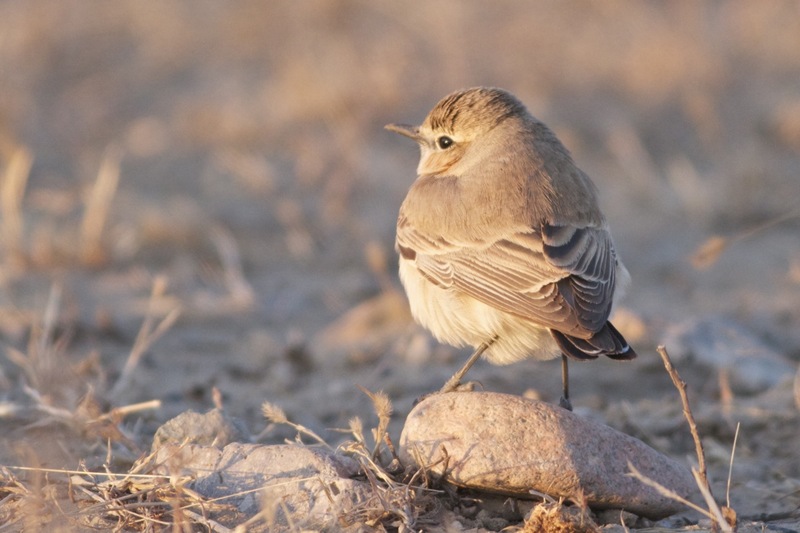 This morning I found what I believe is the 2nd Beijing record of Desert Wheatear. 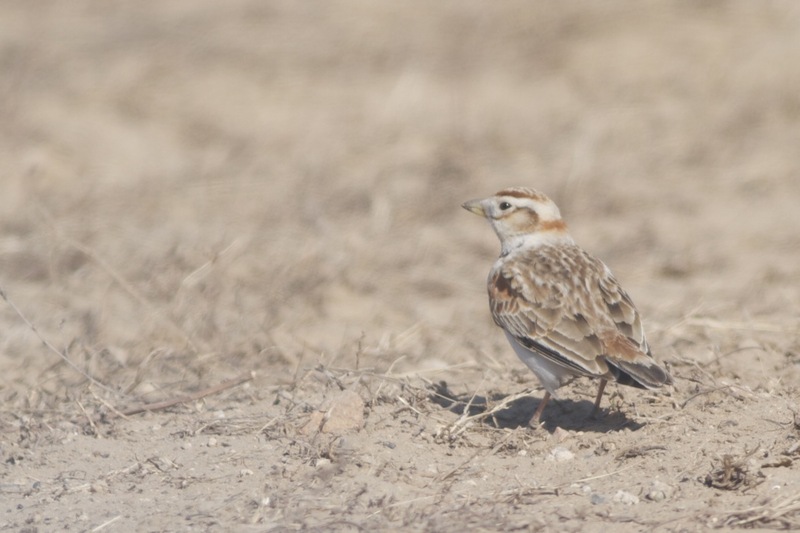 It was the highlight on a special day that included 19 stunning Oriental Plovers, 12 Relict Gulls and a Mongolian Lark. Early April is a great time in Beijing with migration stepping up a gear as the winter visitors (e.g. 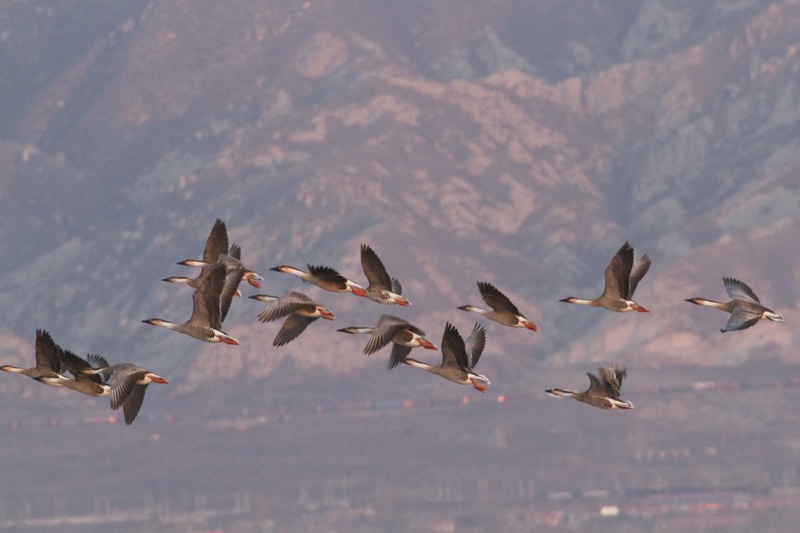 cranes, geese etc) begin to move on and birds from further south take their place. Swan Geese are now moving through in good numbers and I counted 67 first thing. An over-eager bird photographer in his 4×4 saw I was looking at this group, drove directly to the water’s edge at pace and, not surprisingly, the birds took flight. The silver lining was that I was able to capture this image of the flock rising against the mountains in the early morning sun..
A check of the ‘desert’ area for Oriental Plover initially drew a blank but, as I was watching a group of Little Ringed Plovers, 9 Oriental Plovers dropped in, closely followed by 2 more, then another 4 and then, amazingly, another 4, totalling 19 birds… Wow! The birds were in a variety of plumages with most in full breeding attire. 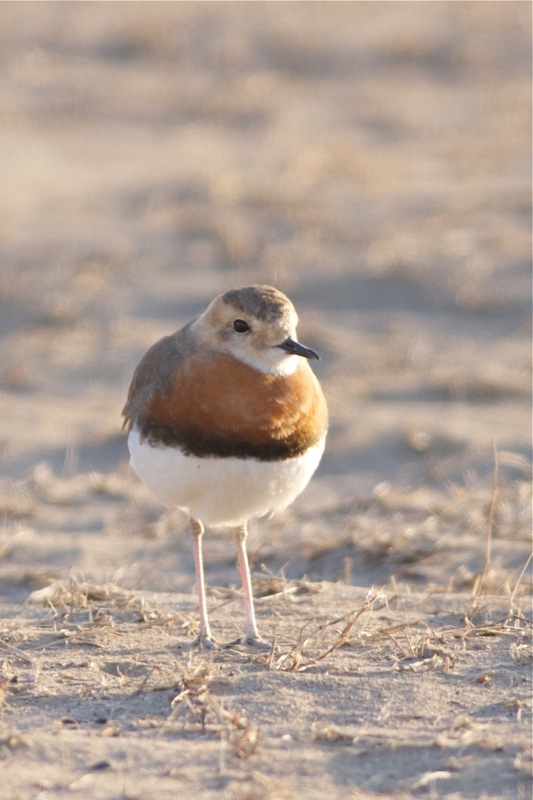 Oriental Plover is a jewel among waders and its inaccessible breeding and wintering sites make it a difficult bird to see. I will post some more images and video of the Oriental Plovers separately but here is a portrait of one of the smarter birds in the group. Oriental Plover, Ma Chang, 5 April 2012. A wonderful bird. I watched these birds for about 20 minutes before heading towards the yurts on the edge of the reservoir to the west. It was on the way that I caught sight of a small bird perching on a stone. Through the binoculars I could see it was a Wheatear. Any wheatear is scarce in eastern China, so I knew it was a good record. I walked around so that I had the sun behind me and slowly edged closer. It was very confiding and, after grabbing a few images, I was pretty happy that it must be a Desert Wheatear. I knew one had been seen at the same site in 2010 (the first Beijing record). But then I began to have doubts.. I had never seen Pied or Isabelline (the other two possibilities).. and unfortunately I didn’t see the tail pattern well at all.. which I knew would be very instructive. Shortly after I took the images below, the wheatear was flushed by a Merlin and flew high west until out of view. 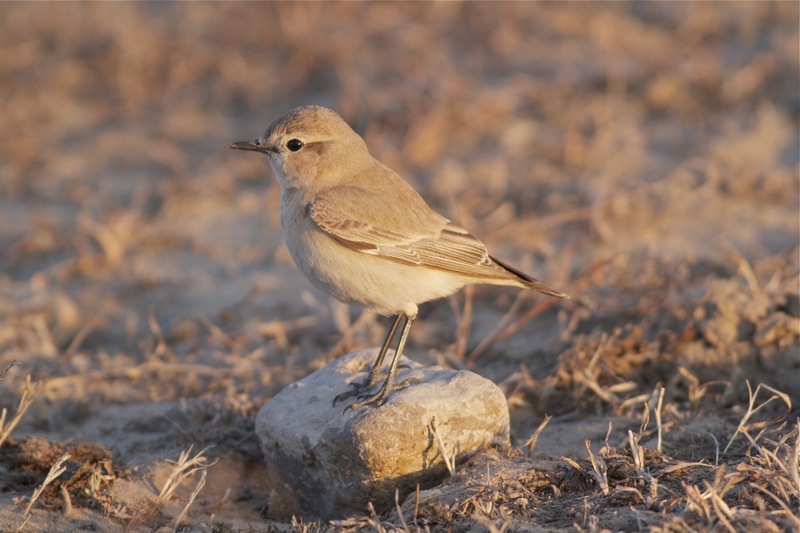 On returning home, I checked images on Oriental Bird Club image database and worked out that it could only be a Desert. Jesper Hornskov kindly confirmed the id. Desert Wheatear (female), Wild Duck Lake, Beijing, 5 April 2012. Thought to be only the 2nd record of this species in Beijing. Desert Wheatear, Wild Duck Lake, Beijing, 5 April 2012. The only other Beijing record I am aware of is of a male at the same site in April 2010. I had only been on site a couple of hours and already I had seen some special birds.. it was one of those mornings that makes you so happy to be alive! Just a few metres from the Desert Wheatear I stumbled across a Mongolian Lark, a regular but scarce passage migrant. 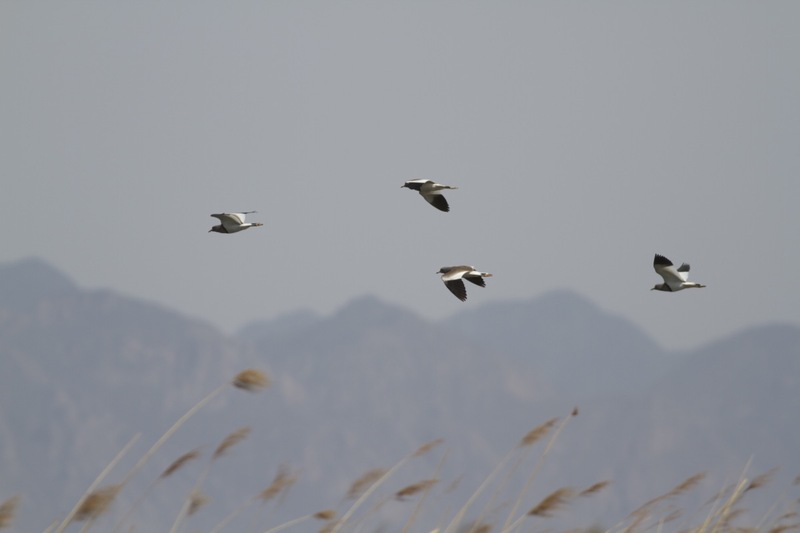 After enjoying 2 Avocets (my first in Beijing) on the edge of the reservoir, I headed to the ‘island’ to scan the duck.. Here there was a good selection of wildfowl but the highlights were a flock of 10 Relict Gulls in stunning breeding plumage, soon joined by a further 2 birds, and a single Red-billed Starling that flew in from the east, settled briefly on a nearby tree and then headed off west again.. another first for me in Beijing. It was about this time that the wind began to increase and, within a few minutes, there were some large dust clouds being whipped up, making Ma Chang an uncomfortable place to be… These winds are quite common at this time of year and, after the very dry winter, the ground is very dusty, making dust storms fairly frequent occurrences in Spring. Yeyahu didn’t produce any major surprises and it wasn’t long before I headed home having had another great day at Wild Duck Lake. Grey-headed Lapwings at Yeyahu NR, 5 April 2012. Red-billed Starling – 1; my first record at Wild Duck Lake; flew in from the east, rested briefly on the island to the north of Ma Chang and then continued West. Desert Wheatear – 1 (fem); very confiding until spooked by a Merlin and then flew high west and lost to view. Had not returned an hour later when I re-scanned. As I said on Facebook, you’re having a very good spring (and it’s only just started). Well done and happy birding!